The first thing any of us do when we put on a skirt is twirl. We may not know it when we are little, but what we want to know is the following: How does it move? Is it stiff or does it move with me? Is it fun to wear? And, Is it comfortable? Or maybe it's just these questions, Does it make me look good? Do I feel good wearing this? This beautiful twirly skirt for ribbons that flyaway answers these questions in this way: Very Twirly, Moves with you, Absolutely!, Without a doubt, Very, and She won't want to take it off. 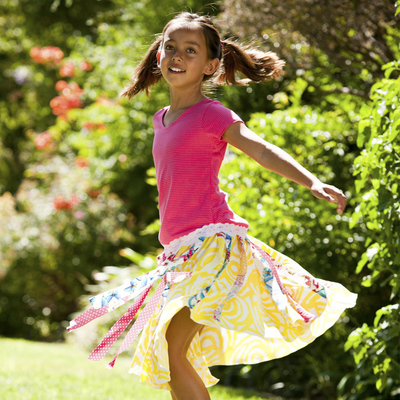 Our Pinwheel Twirly Skirt delivers.